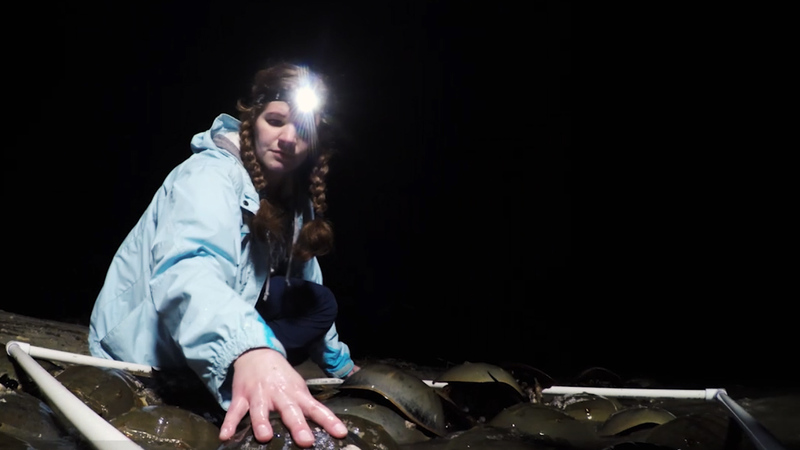 During horseshoe crab spawning season, volunteers are dispatched along the Mid-Atlantic coast to help scientists track their populations. Learn how citizen scientists track the data and have fun on the "big crab count"! We really do have a crab line tonight! Oh, this is so exciting! Three females and twelve males. Here in the Delaware Bay, in both Delaware and New Jersey, we complete spawning surveys every year from May and into June. It’s so important for us to do these surveys because we want to know how many horseshoe crabs we have so that we can properly manage them for the biomedicine, the eggs for the migratory birds, as well as watermen who collect them. We go out during the full moon and the new moon, when you have your highest high tides. We come out with volunteers, and we take measurements every ten meters down the beach, and we count in a one meter by one meter quadrat how many male horseshoe crabs and how many female horseshoe crabs we have. That data is collected from Cape Henlopen in southern Delaware all the way up to Woodland Beach, and then across the New Jersey side as well. Zero, zero. Zeroes are data, right? All that data is put together, and it’s used to figure out what our spawning population of horseshoe crabs is in the Delaware Bay. Delaware's shorelines have the largest population of horseshoe crabs in the world.